The International Monetary Fund (IMF) estimates that the world economy will grow by 3.5 percent this year, with the impetus coming less from Europe and more from dynamic, newly industrialized countries. One example is the automotive industry. According to the association for the German automotive industry (VDA), China’s share of the market in passenger cars increased by 59% and that of Brazil by 18% during the first few months of 2013. The same market is also growing in India and Russia. For a long time, new production facilities have been planned and are under construction, providing great opportunities for the machine tool industry – as the example of EMAG proves. Specialists are developing turnkey manufacturing systems that are tailor-made to suit specific market conditions, with the new production facilities in particular gaining substantially from this increased market activity. Whether in the automotive or energy supply industry, the development of industrial key sectors within the BRIC countries (Brazil, Russia, India, China) has a direct influence on the machine tool industry, as it is this branch that, in the end, must supply most of the necessary manufacturing solutions. There are numerous indicators for this fact. For instance, according to Germany Trade and Invest (GTAI), the Russian enclave of Kaliningrad will – over the next 3 years – will see an investment of 3 billion Euro in six assembly facilities and fifteen sub-supply companies for the national automotive industry, with more international sub-suppliers also establishing outlets in the market. Similar activities are reported from Brazil. According to Anfavea, the country’s automobile association, approximately 22 billion USD are to be invested in production between now and 2015. In India, economic growth is generally attracting “an abundance of investment projects in the country’s infrastructure, as well as in new industrial complexes,” states GTAI. The German machine tool industry is prepared for such a dynamic development and the opportunities it provides can be seen in the textbook case of EMAG. Their specialists see themselves as “partners in solutions” for the metalworking industry. Such an approach is of great importance, especially in the emerging markets. 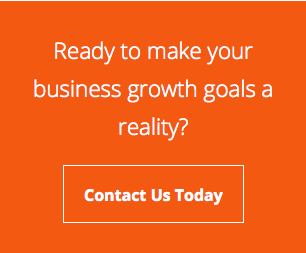 “As it happens, we don’t just deliver a machine tool. 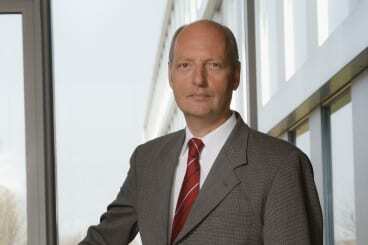 We deliver closely pinpointed manufacturing solutions that are, in every respect, tailor-made to customer requirements”, explains Dieter Kollmar, Managing Director of EMAG Holding GmbH. “This applies, of course, to typical factors such as batch sizes, component variants or, more generally, the flexibility of the processes applied. At the same time, we determine locally the technologies, automation equipment, interfaces and control systems required.“ The advantages for the customer are obvious, especially where an existing production line is extended or where a greenfield manufacturing facility must be created in a new market place. Our manufacturing systems are always “from a single source.” Even complex processes with peripheral machines and equipment are presented as turnkey projects by EMAG, thus considerably reducing the efforts of local production planners. The VL 2 is a pick-up turning machine with which the EMAG engineers are fulfilling a combination of two extreme demands: highest possible output rates on the smallest possible footprint. “This is a truly all-important aspect,” confirms Dieter Kollmar. “Although the floor space requirement for this vertical turning machine is just about 5 square meters, it is a machine of substantial capability, including a fully comprehensive automation concept with conveyor belt, workpiece storage and pick-up spindle. In combination with vertical turning, this results in very fast machining processes. “In other words, short loading travel guarantees the lowest possible component cost. Compared to horizontal turning machines, productivity rates increase quite noticeably. And maintaining the VL 2 is simple. All service units are freely and quickly accessible. The user can set up the machine in one step. “That too is important, when productivity levels enter the equation. Operators without prior experience, working at a new and unfamiliar location, will be able to quickly familiarize themselves with the machine. All in all, this is an optimal solution for those who want to extend production with as little investment as possible,” notes Kollmar. 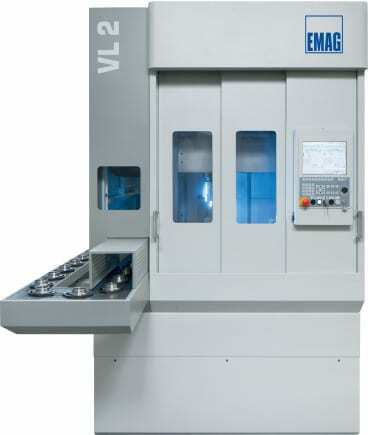 A similar approach is shown with the VT 2-4 Vertical Turning Machine, with which the EMAG specialists have created an equally fast manufacturing system for shaft production. Even demanding machining processes can be realized on it. 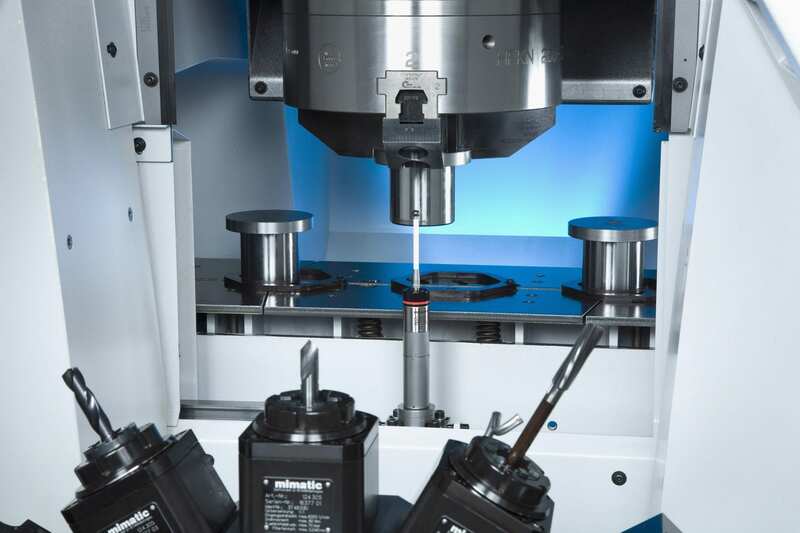 When machining shafts up to 400 mm length and 63 mm diameter, component costs reduce considerably, with extremely short chip-to-chip times (as with the VL 2) being the reason. Workpiece grippers transport the workpieces into the machine and remove them again, once they have been machined. 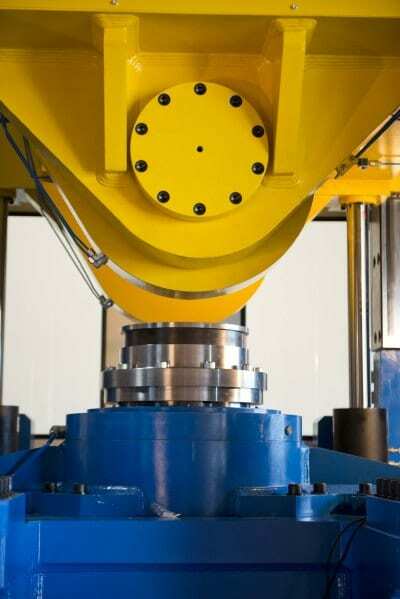 Depending on the workpiece, the changeover can be accomplished in just 6 seconds. And the actual turning process is fast, too. 4-axis machining allows the component to be machined from two sides simultaneously. 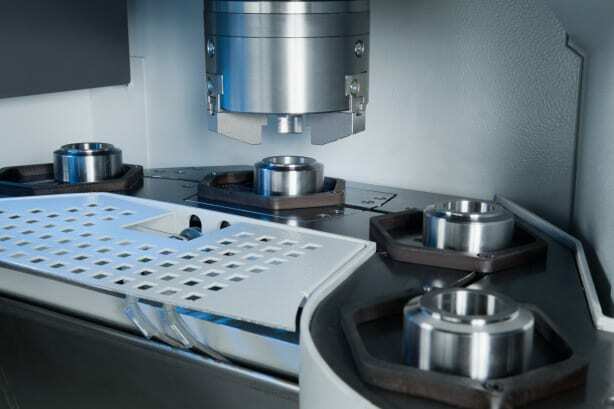 Vertical alignment of the workpieces provides consistent process integrity, as the unrestricted chip flow prevents the formation of clusters in the machining area. “We are convinced that these EMAG solutions are optimally designed to cover not only the specific requirements of an emerging market, but also those of Europe and the USA,” as Dieter Kollmar his company’s philosophy. Everything is greatly simplified, starting with production planning, as there is no need for separate workpiece and finished component storage, with the added advantage of a reduced floor space requirement. At the same time, the EMAG Group engineers act as central project developers, having access to machines with optimal interfaces. This guarantees a fast run-in and makes the machines maintenance-friendly. “When it is a question of arriving quickly at a wholly integrated, highly effective manufacturing solution, this approach must – from our point of view – be the first choice,“ Kollmar concludes. EMAG has a long history, starting back in 1867 in Bautzen, Germany, as an iron foundry and engineering works. Re-established 60 years ago in Eislingen, Germany, in 1952 to make lathes and special-purpose machines, today it makes manufacturing systems for precision metal components from its headquarters in Salach, Germany. Its machines range from basic round-part vertical turning centers to machining centers with as many as six axes handling large workpieces. 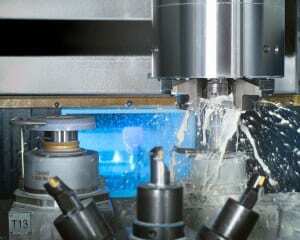 They perform turning, milling, grinding, hobbing, drilling and more as singular purpose setup or combination machines. The machine builder takes pride in its ability to produce high-precision parts. In one example, Axle Alliance in Redford, Mich., needed to hold to a 25 µm tolerance for 390 mm diameter steel ring gears during hard turning, which is done prior to grinding the gear teeth. EMAG worked with Axle Alliance to develop a probing process that ultimately delivered a variation of less than 15 µm. Axle Alliance now uses six machines built at EMAG’s headquarters in Germany, each dedicated to a part line. Another example comes from Precima Magnettechnik in Brückeburg, Germany, whose customers expect absolute perfection from, in this case, housings for brakes used mainly for wind turbines. Precima had had issues with machine vibration causing negative effects on tool life and surface finish. However, the rigidity of EMAG’s turning machines and the vibration damping quality of the base allows for the very high feed rates and cutting speeds required in precision hard-machining. Precima now runs four vertical pick-up turning machines from EMAG. 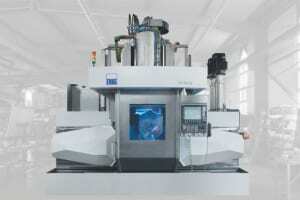 Loetzner gives much of the credit for the machines’ capabilities to long-time partner Siemens. 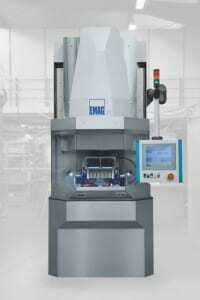 EMAG has standardized on the Siemens Sinumerik 840D CNC platform, specifically the solution line and power line. Loetzner likes, in particular, that the CNC controller is an integral part of the PLC, and they are able to do almost everything through the CNC, including making it look like a PC for the operator. The common look and feel for the operators makes for easier onsite commissioning and cross-training, Loetzner adds. In one recent case study, EMAG needed to provide grinding, turning and turn-grind machines to a major agricultural equipment builder, and the machine builder relied on the 840D CNC. “We needed to devise a control solution that would satisfy all the needs of the various machines we were supplying to this demanding customer, based on a common platform, to enable easier design, integration, startup, commissioning on-site and training for our customer’s operations and maintenance personnel,” Loetzner said at the time. Similar control technologies are used on EMAG’s newer-technology machines, including laser welding and electrochemical machining centers. These technologies have little impact on the control or automation schemes, Loetzner notes, because they still are essentially performing the same task, whether in a dry, lubed, gas-cooled or underwater environment. Only the sensors and encoders need to change to accurately feed the relevant data to the control. In fact, the controls are often much simpler because the axes of motion are fewer, though more multi-axis and workpiece manipulating machines are being developed. The CNC also enables remote monitoring over a wireless network so that process engineers can see what the operator sees on each machine. The agricultural equipment customer mentioned has used the remote monitoring capability on a wide variety of EMAG machines for several years, with all data communicated through a single information network that’s accessible by both EMAG and Siemens. Through this arrangement, they have been able to significantly reduce downtime, service calls and troubleshooting identification time. 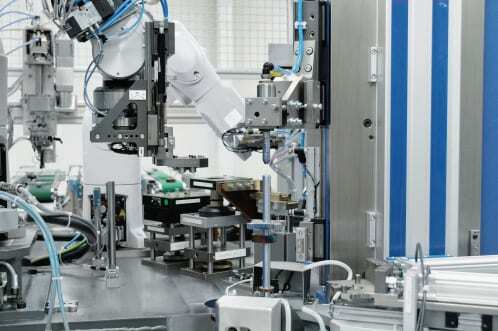 More than 75% of the EMAG machines at this customer site are equipped with robotic devices. The lights-out capabilities this provide make remote monitoring that much more important. Remote monitoring can be done directly through the Sinumerik CNC in a one-on-one exchange with the customer, Loetzner notes, or even a three-way exchange involving Siemens as well. EMAG reduces those times partly by use of the Japanese chaku chaku principle. Meaning “loading loading,” the idea is to bring various process steps as close together as possible to improve the speed between the processes. EMAG’s vertical machining centers not only fill a much smaller footprint on the plant floor, they also improve chip flow. Also, all of EMAG’s machines are self-loading, with a servo-controlled shuttle traveling through the machine, but not through the work envelope, Loetzner notes. 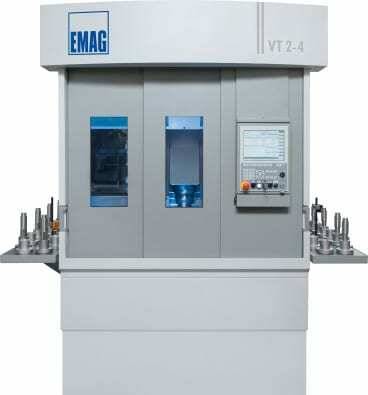 Check out Cutting Tool Engineering’s coverage of EMAG’s VL 2 P at IMTS 2012 HERE. Automobile manufacturers all over the world were able to enjoy an increase in their sales figures, this year! The biggest increases were experienced in the USA, China, India and Russia. However, the rapidly increasing number of vehicles built also brought some production challenges – for instance, the sub-contractors must deal with the increasing output levels and also need to ensure that process safety and component quality do not suffer. In fact, even the smallest components with complex geometries must be produced with increasing levels of precision. In the development of the VLC 100 G Vertical Grinding Center from EMAG, our grinding specialists have made sure that the machine concept offers efficient, error-free machining processes for the production of small chucked components. Small chucked components are typically produced in large quantities. The demand for components, such as gearwheels, planetary gears, chain gears and flanged components for cars, for instance, have necessary quantities that typically go into the millions; and short cycle times in the production of these components have become mandatory. For instance, the internal contour of a gearwheel must be ground in the shortest possible time and the machine’s workholding unit must be loaded with a new workpiece just as quickly. In many production environments, this represents a critical moment, because the idle time is commonly a decisive factor in establishing the economic viability of the whole process. The VLC 100 G is equipped with three axes (X, Z, C). The machine uses its overhead pick-up spindle to load itself. 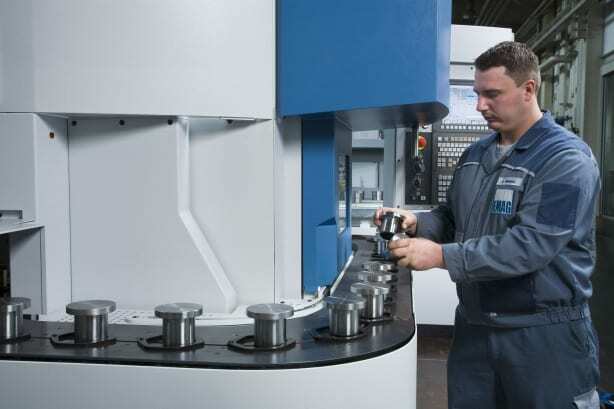 The machining area features one or two grinding spindles for internal and/or external work. Measuring processes can also be integrated into the machine, making quality control an integral part of the whole process. 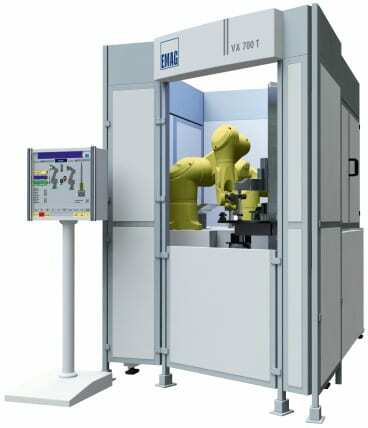 The measuring probe is located between the machining area and pick-up station, where it is protected from contamination. An important feature of the VLC 100 G is that it offers the possibility to use two grinding spindles, which can be used to perform different grinding operations, or to handle both rough- and finish-grinding work. In other words, the first wheel performs the “rough” job of removing excess material from the raw-part at high feedrates (the CBN wheel is specially designed to absorb the necessary forces), while the second wheel (with different specifications) takes over the finishing work to guarantee a perfect surface finish on even the most challenging geometries. With the help of this intelligent tooling combination, EMAG design engineers have succeeded in drastically reducing the grinding time of even very complex components. “For the removal of large amounts, two wheels offer a shorter cycle time than one, with the first wheel designed to do the rough-grinding and the second one in charge of finish-grinding work,” explains Dr. Guido Hegener, Managing Director of EMAG Salach Maschinenfabrik GmbH in Germany. Very easy access! Generously designed maintenance and service doors make the machine easy to access. The combination of fast loading and efficient grinding processes leads to a very compelling machine concept. The VLC 100 G works very well with the dynamic developments in automotive production. Now, with the rapid increase in required quantities, the demand is for new machine concepts that can be integrated into existing production without any problem. With the VLC 100 G, two features enable it to be integrated without any problems. “Programming the workpieces with our new EMAG NAVIGATOR software is simple and intuitive, saving valuable setup time. For many production environments, this is an advantage that should not be underrated,“ confirms Dr. Hegener. Furthermore, the exceptionally small footprint for the VLC 100 G should make the work of every production planner easier. The stand-alone machine occupies about 4.5 square meters (48 square feet), making sure that the growth of a production facility of this kind will not be limited by floor space requirements. The dressing unit with diamond roll. 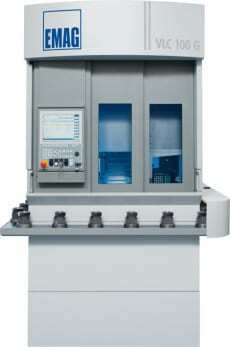 The machine can accommodate both internal and external grinding spindles. Increasing demands made on precision and the push for the decrease of price of modern components is pushing traditional manufacturing processes to their limits. From September 10th-15th, 2012 at IMTS in Chicago, IL, EMAG will present three production technologies that complement or replace traditional processes such as turning, milling and grinding. The ECM process is used to deburr components only at the points where material needs to be removed, and without it having any mechanical or thermal impact on the workpiece. 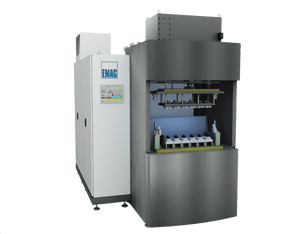 With its PECM technology (Precision Electro-Chemical Machining) EMAG presents a production process that opens up completely new fields of application. PECM is a process for the machining of high-alloyed materials, such as nickel- and titanium-based alloys. The disadvantages of traditional metal cutting – tool wear, mechanical stresses, micro-fissuring caused by heat, oxidization layering and the need for subsequent deburring operations – are eliminated, because this process is a non-contact one without heat input. All electro-chemical machining processes are characterized by stress-free material removal, smooth transition points and surfaces without ridge formations. 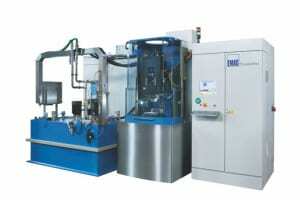 Six in one – the EMAG ECM deburring process can be adjusted to suit individual production requirements. The advantages that the PECM process provides for different branches of industry are best shown with the example of a turbocharger for the automotive industry. The electro-chemical process is one that can be used to effectively in the machining of many high-alloy components, especially those in the high-temperature sector of the turbocharger – it also offers a much shorter and very efficient process chain. 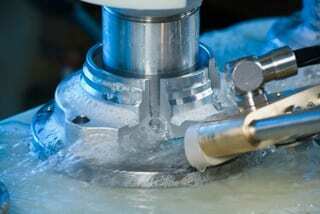 The typical clean-up operations necessary when traditional machining processes are used – such as deburring after milling – are no longer necessary. PECM machining operations are burr-free. And there is hardly any tool wear. The result: downtimes are minimal, when compared to milling (which requires regular tool changes). The process as a whole is sturdier and less prone to errors. And another important factor that our example of the turbocharger shows: the superb surface finish of the PECM process, where Rz-values of 0.3 micron can be achieved. Will camshafts ever again be made of a single piece? Heat-shrink assembly of camshafts for small-power and passenger car engines. Another highlight is EMAG‘s heat-shrink assembly technology, a process that scores particularly well in camshaft production. The high degree of precision achieved with the joining process drastically reduces the number of cam profile grinding operations or – with the use of precision cams – avoids them altogether. Another benefit of the process is the ability to combine different materials in the construction of the shaft, such as forged cams (e.g. in 100Cr6) and sintered cams, which do not require regrinding. Accessory components, such as plugs and end pieces, can – like the shaft itself – also be made of better materials. 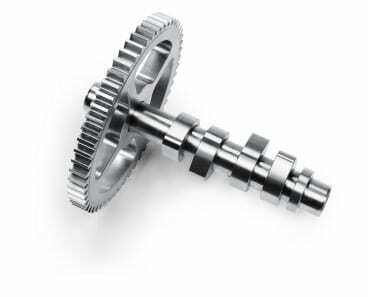 This allows for the camshaft to be adapted to the requirements of the engine and to be optimized in load bearing capacity and manufacturing costs. Operating costs are cut in half with the fiber laser on the new ELC 160 laser welding machine. Production laser welding is already a highly productive process in the manufacturing of gearwheels. The use of diode-pumped solid-state lasers – such as disc or fiber lasers –reduces operating costs by up to 50%. EMAG has been involved with the use of solid-state lasers in the welding of powertrain components from an early stage and is considered a pioneer in the technology. EMAG again has fulfilled a promise to their users offering them the lowest possible cost-per-piece, by coming up with an innovative technology that brings true cost benefits. 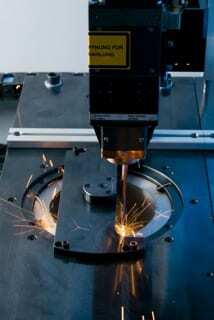 For many applications, solid-state lasers allow welding without shielding gas. This not only reduces operating costs, it also avoids having to follow the annoying logistics imposed by the use of shielding and laser operating gasses. In many cases, the welding process can also be sped up considerably. This increases productivity and – through a reduction in energy input per unit length – reduces welding distortion, resulting in better component quality. High component quality with low production costs is required in many applications involving machining chucked parts. At IMTS, September 10 – 15, 2012 in Chicago, EMAG will be showing these solutions which combine these requirements. One of the highlights at the show will be the introduction of the brand new VL 2 P, a vertical pick-up turning machine which operates using pendulum technology. Whether you want to manufacture small chuck parts or larger components, the machining processes must ensure accurate component geometry while also guaranteeing low component costs. These requirements and more are met with the VL 2 P and VL 5i vertical turning machines as well as the VSC 400 DDS turning and grinding center from EMAG. 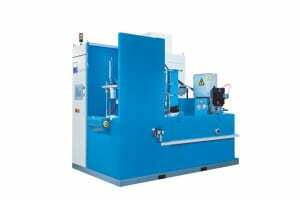 The advance in productivity is provided by the EMAG design of these machines with the integrated pick-up automation and a machine body made of polymer concrete as well as the vertical design which ensures perfect chip flow conditions. Workpieces up to 100 mm in diameter can be machined in full on the innovative VL 2 P, a two-spindle turning machine. The machine has two spindles because while one workpiece is being machined, the second spindle automatically loads itself using the pick-up method. This means that the next raw part is immediately ready for machining, resulting in extremely short chip-to-chip times. 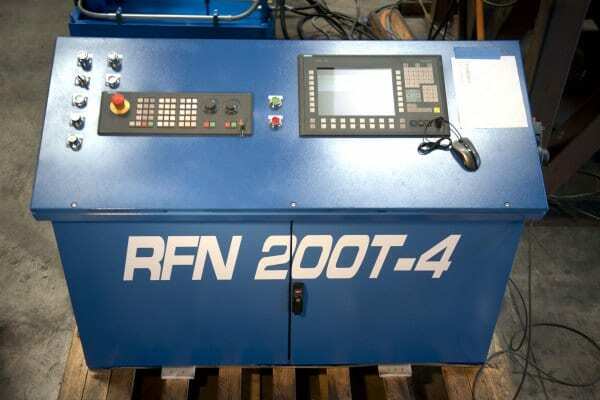 The focus during the design of this machine was efficiency and eliminating idle times. The VL 2 P also has an incredibly small footprint due to its compact design, which helps decrease the chip-to-chip times. See it in action at IMTS 2012 HERE. 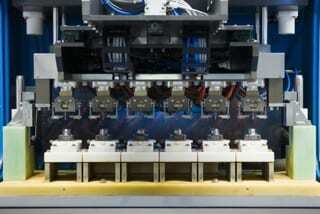 The VL 5i turning machine is a universal solution for production companies. 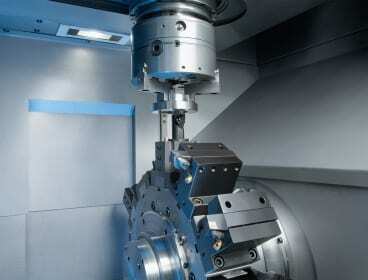 It can completely machine workpieces of up to 250 mm in diameter in a single clamping operation. In addition to the powerful pick-up working spindle with a rating of 28 kW and a torque of 300 Nm, the machine also has an automation system with a revolving belt which contains drag frames. 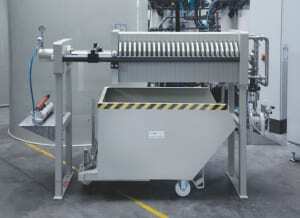 The machine could be described as being self-automated, which means that new raw parts can be positioned and finished parts removed at any time. Another strength of the VL 5i is its short idle times because the distance between the loading and the machining positions is just 550 mm. The VSC 400 DDS vertical grinding and turning center combines a range of processes and guarantees extremely cost-effective processes in the production of complex chuck parts with a diameter of up to 400 mm. Within a single clamping operation, the center can complete scroll-free turning and hard turning as well as subsequent grinding processes. Grinding is only used where quality and process reliability demands it. 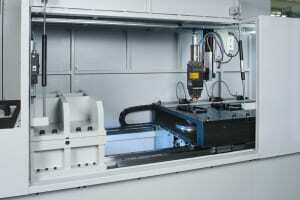 The center can also be fitted with drilling tools or hardening modules to suit the required machining task. Even measuring tasks can be integrated. Farmington Hill, Michigan – EMAG L.L.C. here today announces the introduction of its ECM and PECM machines to the North American market. 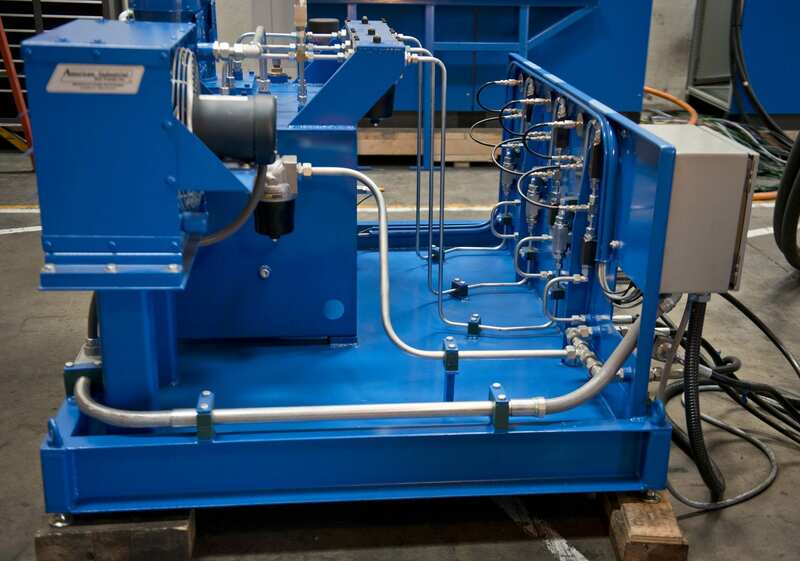 As a longtime European leader in these technologies, the company will sell and support these machines with application engineering, field commissioning and technical service from its Detroit-area location. Electro-chemical machining takes many forms, but all involve the electrolytic dissolving of metal substrates. This technique is often utilized in applications involving hard-to-machine materials such as Inconel, high-nickel alloys, titanium etc. Because ECM is a non-contact machining process with no heat input involved, the process is not subject to the variances inherent in conventional machining, such as tool wear, mechanical stress, microcracking caused by heat transfer, plus surface oxidation and recast layer present with EDM (electrical discharge machining), for example. By contrast, the ECM process is characterized by stress-free stock removal, smooth and precise transitions in machining contours with burr-free surfaces. End products from turbine blisks to dental implants and automotive industry products are ideal uses for this technology, according to Tobias Trautmann, product manager for ECM/PECM Products at EMAG ECM. duction in nearly all machining areas; reproducible cutting depth to <20mm; extremely high-precision machining; no negative thermal or mechanical effects on the material, so no changes in microstructures; basic material properties are unaffected; hardness, magnetic and other performance properties are unchanged; nano and extremely thin-walled section contours are possible, critical in aero and medical applications, for example; high repeatability, owing to the consistency of the mechanical components and predictability of the machining conditions; minimal secondary operations; roughing, finishing and polishing in one machine. The process allows users to employ multiple fixtures and run the process simultaneously. Precise Electrochemical Machining (PECM) machines operate on the same basic principle of electrolytic dissolution, but include a mechanical oscillation mechanism for more intricate 2D and 3D microstructures. All standard machines include EMAG scalable generator technology up to 30,000 Amps, pulse frequencies to 100 kHz and a machine base of MINERALIT® or granite. Complementing this new machine series is the EMAG test laboratory. Users can examine a variety of test cut scenarios to determine the optimum conditions for machining, fixturing, process performance and materials specification, matching the requirements to the most productive machines and systems available. Farmington Hills, Michigan – EMAG L.L.C. 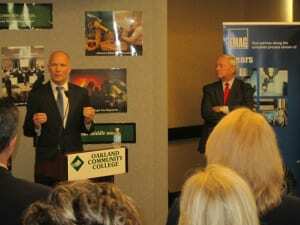 announces its receipt of a five-year, $200,000 agreement with Oakland Community College (OCC), through the Michigan New Jobs Training (MNJT) program, for the training of 21 new employees in manufacturing technology, CNC machine tools, mechanical maintenance, electrical and robotics disciplines. 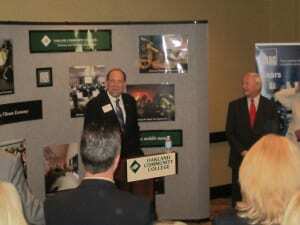 Peter Loetzner, EMAG CEO, accepted the award from Dr. Timothy Meyer, chancellor of Oakland Community College, and J. Brooks Patterson, Oakland County Executive, during the Oakland County Economic Outlook Luncheon, held at the Troy Marriott on April 26, 2012. Beginning the speeches at the event, OCC Chancellor, Dr. Timothy Meyer noted the critical importance of education and training in the creation and retention of manufacturing jobs in Southeastern Michigan, an area hard hit by the recent economic downturn in the auto industry and other manufacturing sectors of the economy. 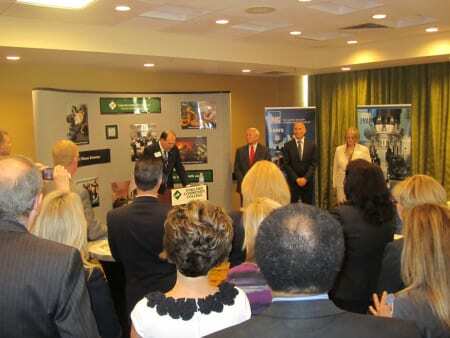 He then introduced Oakland County Executive J. Brooks Patterson, who continued this theme, citing the recent creation of 36,000 new jobs in Oakland County as well as other awards made to companies who’ve chosen to locate in the area. Introducing Peter Loetzner, Meyer then detailed the collaboration between OCC and EMAG, noting how the study of mechatronics would raise the skill level of both engineers and the plant workforce to higher levels of technical competence and multi-functional abilities. During his remarks, Loetzner recounted his own experience as a student in this now rapidly growing field of mechatronics, where mechanical engineering melds with electrical and electronic engineering to help students better understand the inter-relationship of components on a machine. 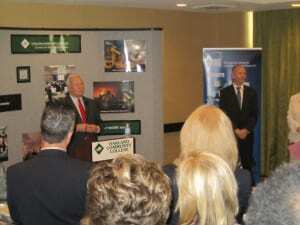 Mechatronic engineers and field technicians are now highly valued individuals in many industries, Loetzner noted. He added that EMAG will have at least 20 openings in engineering throughout the next few years at his company, the result of increased sales and the EMAG commitment to serving the North American market from its expanding headquarters in the Detroit area. He further commented how such programs have the dual advantages of growing the manufacturing base in the area, as well as raising the skill level of the employees, which in turn attracts more businesses to Oakland County. EMAG has engaged in training for its employees as well as its customers’ programming, operator and maintenance personnel throughout the company’s history, both in Germany and in America. The company sells its machines to job shops and original equipment manufacturers’ metalworking departments worldwide, with a heavy concentration in the automotive and off-highway machinery markets. Sharon Miller next spoke at the event, citing the creation of five new jobs programs in the last year, awarded to companies ranging from the start-up mode such as Oxus, a portable oxygen equipment distributor for the medical industry, to the multi-national truck parts supplier Meritor, who added 63 employees in Troy, Michigan as a result of the MNJT program. EMAG equipment covers the entire spectrum of machining processes in the metalworking industry, offering the latest technological advances in turning, drilling, milling, grinding, gear cutting, electrochemical machining and laser welding for the automotive, oil field, power generation and earth moving equipment industries. EMAG is a trendsetter in the field of vertical turning centers, multi-spindle machining centers and multi-functional production machines, and has become an important partner in the realization of complete process streams in the manufacture of automotive transmission, engine and chassis components. Oakland Community College is the largest community college in Michigan, and the 21st largest in the nation. With five campuses throughout Oakland County, OCC offers degrees and certificates in more than 160 fields including university transfer degrees in business, science and the liberal arts, as well as workforce training and certificate programs. Approximately 750,000 students have enrolled at the college since it opened in 1965. OCC also announced an award to Denso, one of the world’s largest suppliers of automotive components, totaling $2.6 million to support the creation of 169 jobs in e-learning, project management, leadership, quality and engineering at the company’s Southfield, Michigan facility. Stama America, Itasca, Illinois announces the introduction of its MC 726/MT-2C mill/turn, twin spindle machining centers for the automotive, fluid power, tooling, medical and other industries, where parts needs to be milled and turned in production operations. This new machining center is the latest iteration of the popular TANDEM concept mill/turn centers, introduced by Stama in 2007. Independent spindles simultaneously turn and mill in sequenced ops, often doubling productivity. Two independent spindles are onboard, each on a traveling column assembly and each supporting an independent swivel table, one of which acts with a bar feeder mechanism. 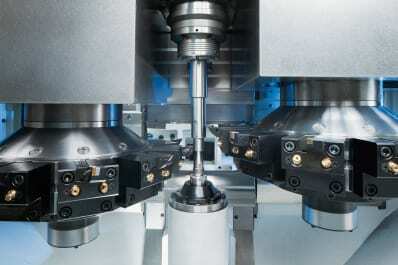 Workpieces are introduced to the turning spindle, then transitioned by a conveyorized gripper assembly to the milling indexer and fed to the milling spindle, before finally exiting the work area. Complete six-sided machining is possible between the two cutting operations, all on one machine with approximately twice the speed of a conventional m/t center in 30% less footprint. Since the first part is being milled simultaneously to the next part being turned, the overall production operation is greatly enhanced, nearly doubling in many applications. Each of the spindles is served by a swivel unit, one acting with a bar feed mechanism.